As our call to worship in our Upstream Service We created rhythms utilizing the different names of the groups present at Pentecost in Acts 2 and then put them all together to experience the movement of the Spirit among the people, bringing them together in one voice. 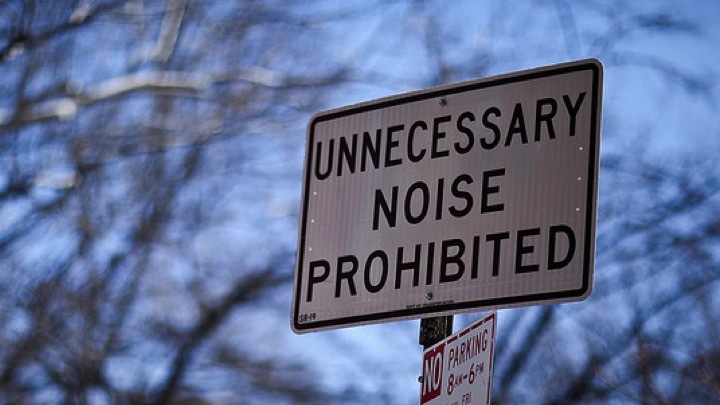 Do you ever feel like things are just a bit… noisy? You just have so many thoughts, so many ideas, that you can’t quite settle your mind down? Or you’re at a big gathering for a meal and there’s so many different people talking that you’re really not sure what conversation to tune in on? Or, you’re at one of those sports bars that seem to have one TV per person and they’re all on different channels and you just can’t seem to focus? 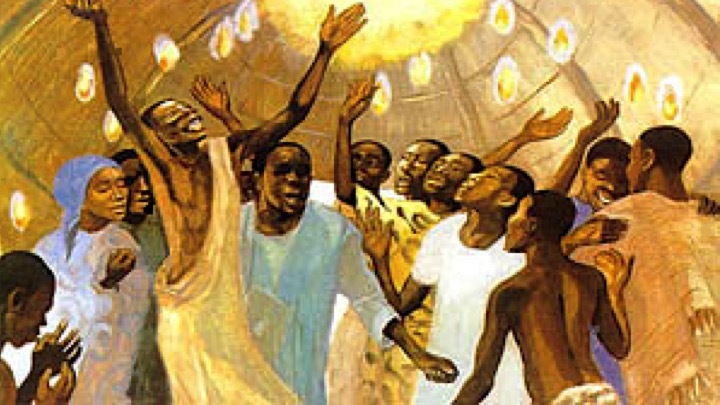 This is the feeling I’m imagining at the very beginning of the Pentecost gathering. 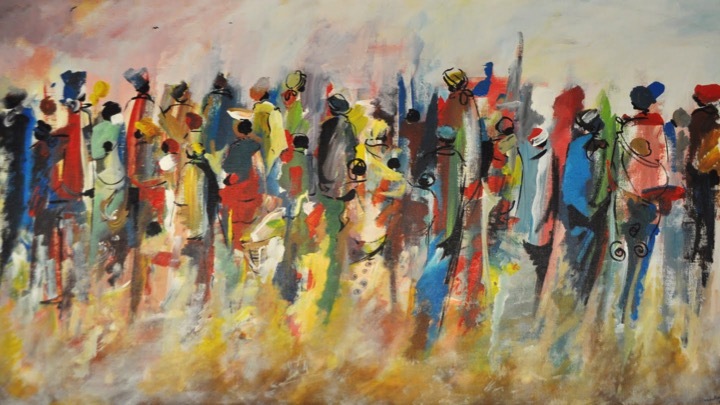 So many different people all drawn together, speaking in their own languages about their own thoughts and issues, everyone is buzzing about wondering what’s going to happen next. I like this picture of it… because it seems just messy enough to be accurate. Since the Holy Spirit has a great sense of humor, this very buzzing about is what was going on in my own brain as I tried to figure out what message this text could have for us today: We could talk about the correlation between Babel and Pentecost. We could explore the modern geography of the nationalities present at that gathering. 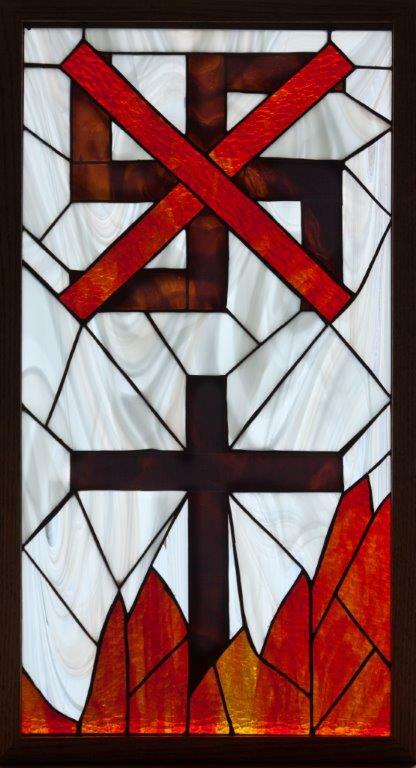 I could attempt to deliver a sermon in Hebrew or Greek to see if the Holy Spirit shows up in the same particular way as in Pentecost so we’re all able to understand Hebrew and Greek perfectly, a miracle I would’ve been really grateful to have happen while I was in seminary. We could explore the Jewish festival of Shavu’ot as the setting for Pentecost, correlating the 10 commandments to the Spirit’s presence. 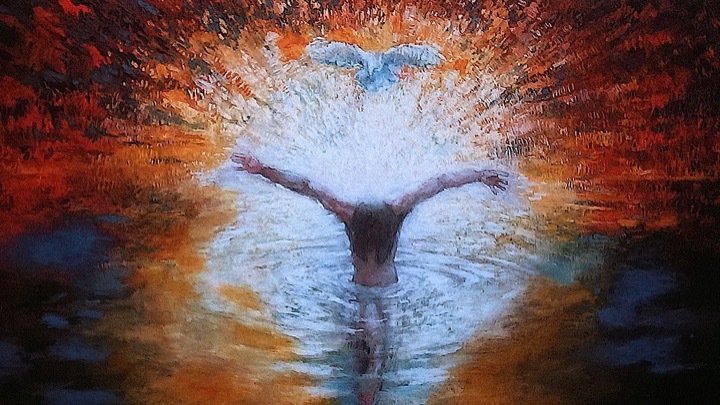 We could talk about how the word for spirit and breath are the same or how the disciples had a similar reaction to the resurrection as they did to Pentecost. This text is overflowing with theological, ecclesiological, and eschatological meaning, but for today the message I know I needed to hear the most, the miracle in this text for me this time around, was the way the Holy Spirit calmed all of this madly buzzing chaos and brought clarity. 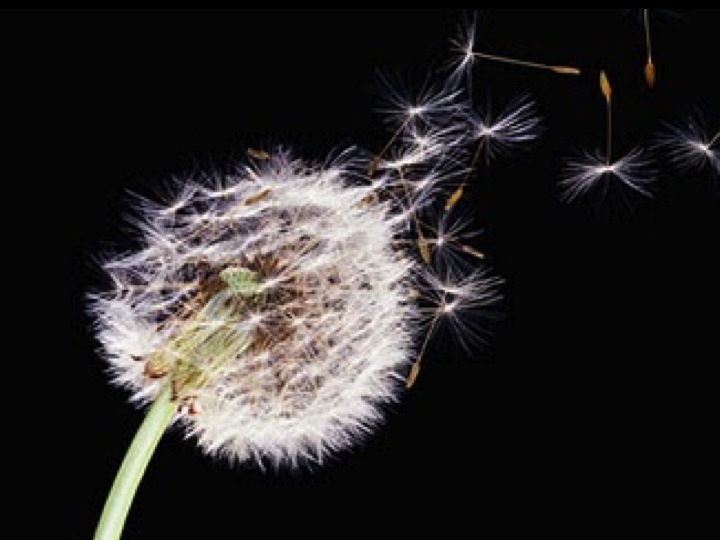 In a whoosh of wind and fire the Spirit transformed the community from frenetic into faithful, from cacophonous into melodious, from fearful into empowered. In the midst of a busy season at the end of a busy year in my own life, I know I need that message. 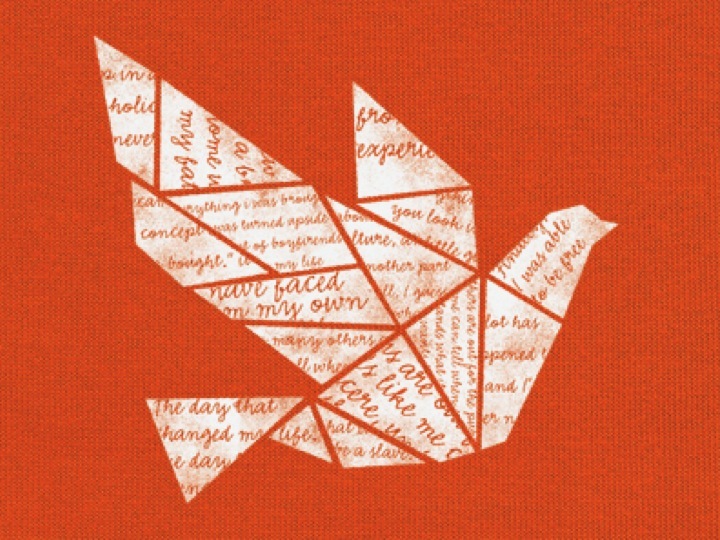 As a congregation freshly emerging from a big year of many celebrations, I believe this is the message we could all use: That when the Holy Spirit moves among us, we can better understand what God wants us to do next, because by the Spirit we can better understand God and each other. After three years of ministry among them, his crucifixion, and then resurrection, Jesus ascends to heaven. 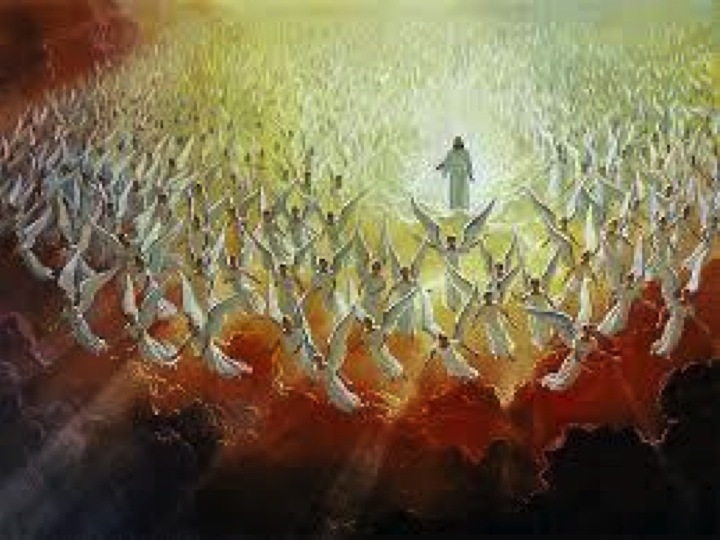 Jesus is no longer there among them to answer their questions, to wash their feet, or to feed them loaves and fishes. And so, they are likely fearful, afraid that they are on their own, that God is no longer in their midst, since the primary way they have experienced God, so far, is through Christ. 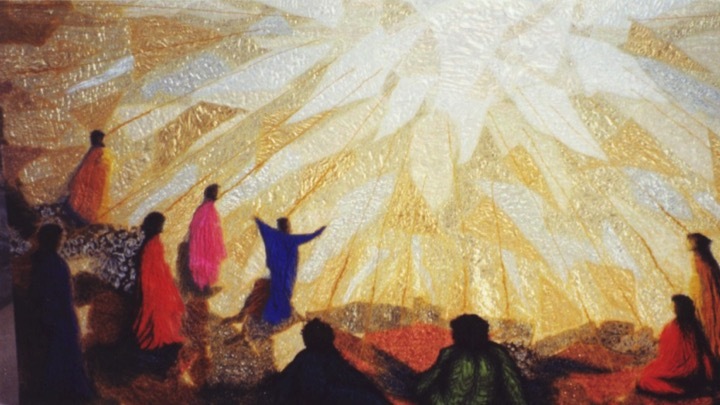 After all that has happened in their lives with Jesus, he gives the disciples the divine version of, “but wait, there’s more.” So at Pentecost they are awaiting the Holy Spirit to come among them. 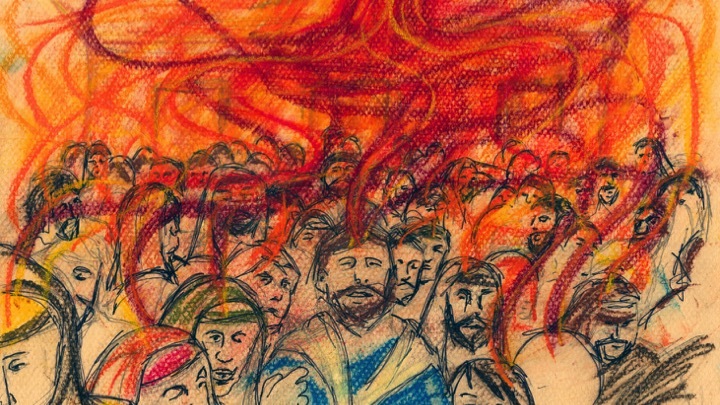 And as the disciples are gathered with “devout Jews from every nation,” the Holy Spirit rushes in with a violent wind, and “tongues of fire,” resting on each of them. And in their bewilderment they draw close together and inexplicably can all understand each other, even though they are speaking different languages. Imagine actually being in this crowd at that time and how it would make you feel: a strong and angry wind, fire all around you. It would certainly be terrifying. Loud noises and fire are usually not an indication of positive things, rather of an attack or hurricane or tornado. 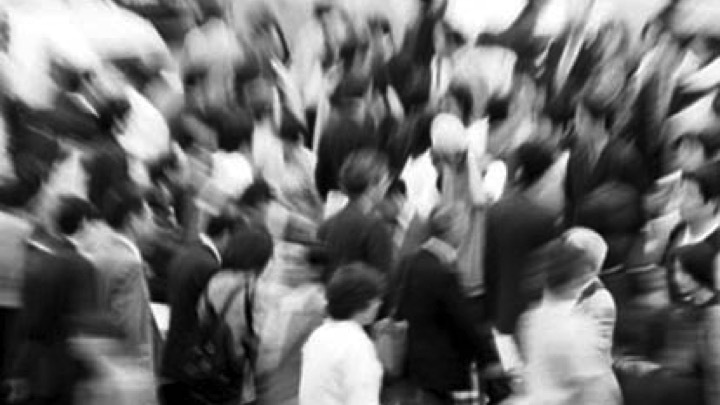 Keep in mind it was a packed crowd in that temple, with lots of unfamiliar faces, perhaps even people in the room who looked like the type of people you had been taught to mistrust. 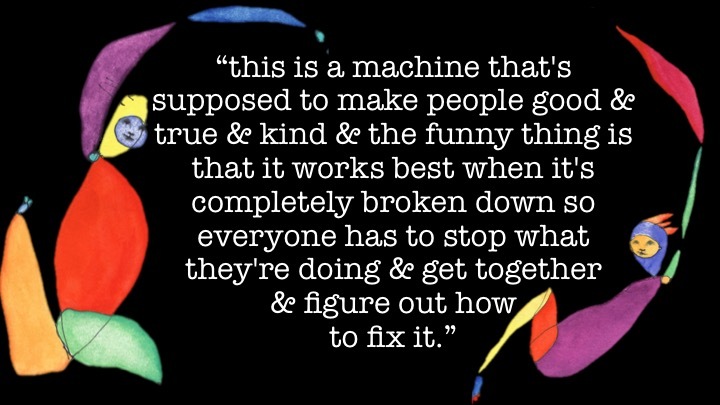 But you’re in this together, whatever bad or good may come of this strange situation. 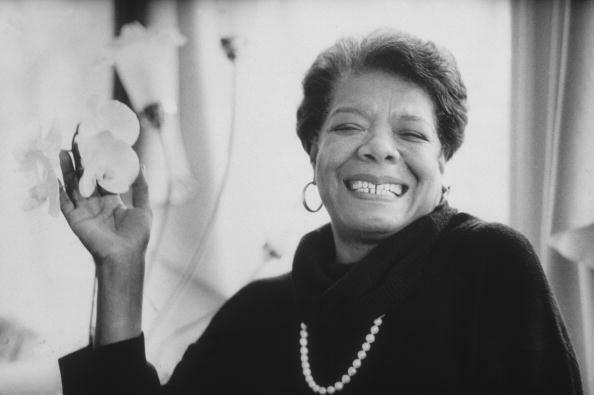 And then all of a sudden comes the moment I love in this passage, where the people in their fear draw closer to one another, and what was initially cowering in fear is transformed into gathering in unity. Their shouts of personal bewilderment aren’t just their own, but those of a common language and voice. They’re terrified, but in their terror they’re able to understand one another and the joy of that newfound clarity turns their panic into relief, discomfort into joy. 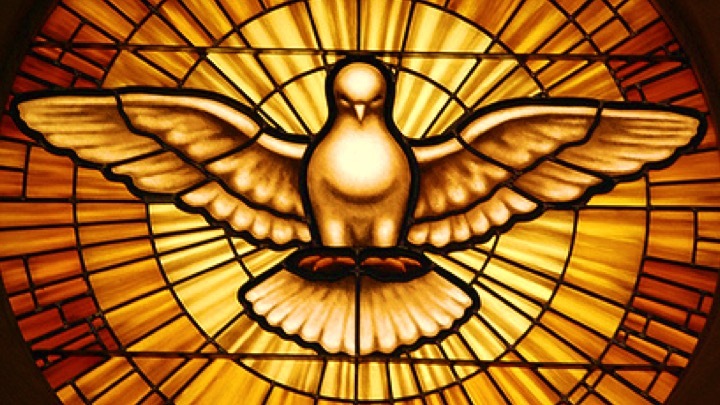 Their unification was initially out of fear, but in surrendering themselves to their astonishment, the Holy Spirit breathes restoration and new beginnings in their midst. 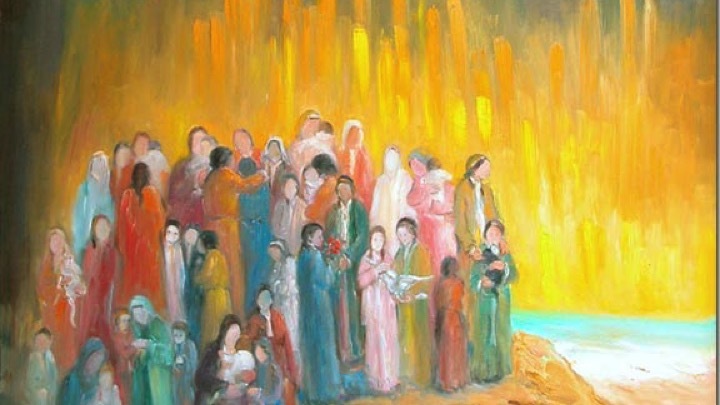 As they drew together in fright the Holy Spirit transformed them into people of one language. As they were able to hear one another and Peter’s preaching they became people of one purpose, the beginning of the church of Jesus Christ. 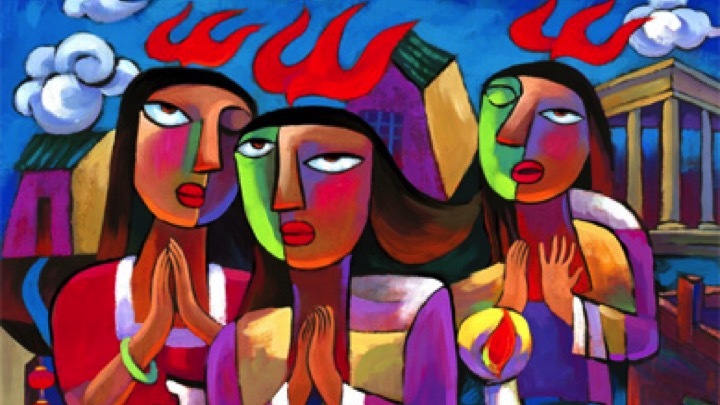 The flames and wind and spontaneous ability to hear in one language were undoubtedly miraculous, but the part of this that I think speaks best to me today, was the way that the Holy Spirit enabled them not just to hear the words that each other were saying, but that the Holy Spirit enabled them to listen to the heart of one another, that they were each laid vulnerable before the other and truly understand God’s prophetic word for all of them. Through the Holy Spirit we experience clarity, a freedom from all of those things that we thought divided us, all those human-created conventions that we thought were necessary steps to accessing God. This freedom can and should shake up our lives, compelling us to reprioritize our own lives, and perhaps even our church to better reflect the priorities of God’s Kingdom. Particularly in our upcoming Summer of Sabbatical, may we be mindful to silence any voices in us that are not of God, ever pursuing God’s call for each of our lives. 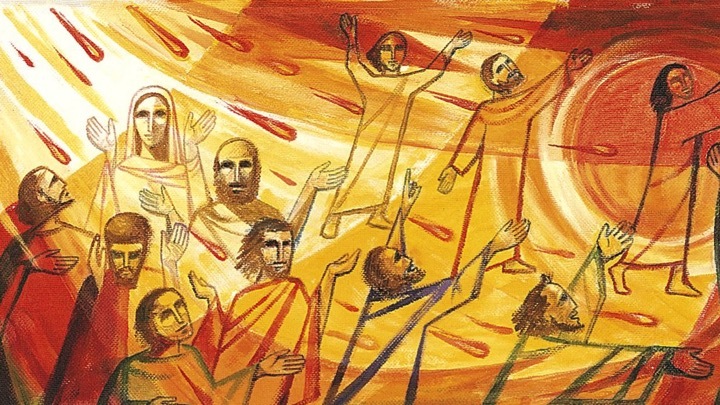 Whether it be through flames of Pentecost or a look of familiarity in the eyes of the stranger, thanks be to God for every time that the Holy Spirit helps us to get out of our own way so that God might be more mightily at work among us. May we ever open our eyes to the ways God is in our midst. Amen. 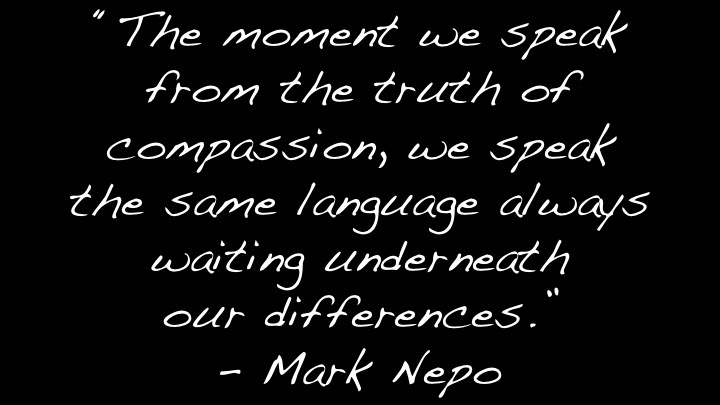 Nepo, Mark. The Exquisite Risk: Daring to Live an Authentic Life. New York: Harmony Books, ©2005. 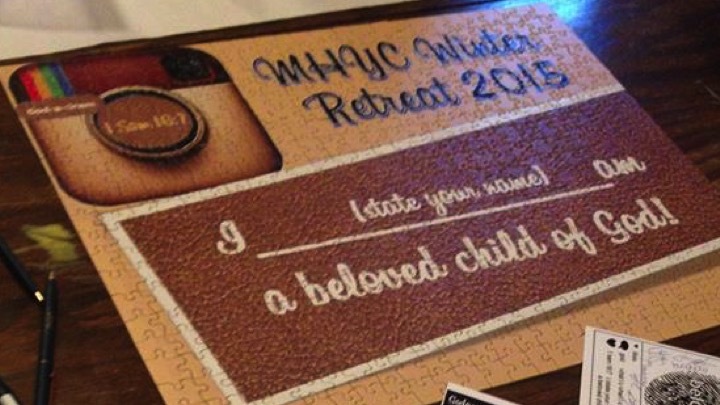 “Beloved” video reflection by the kids of X-team, shown in worship before this sermon. 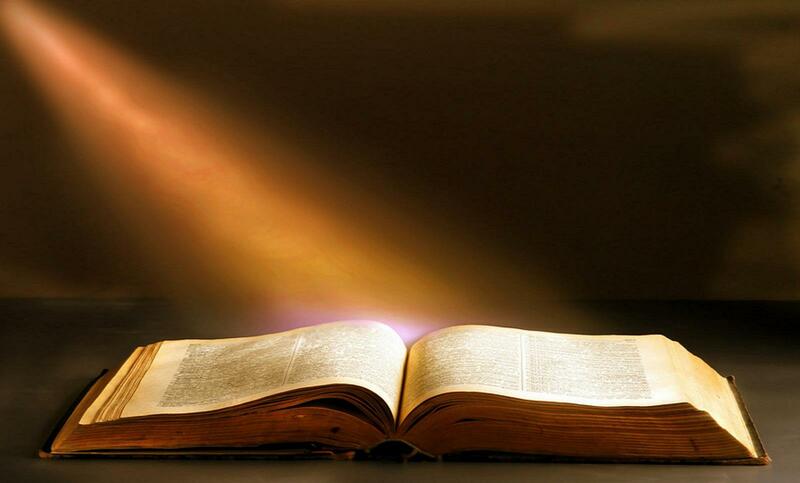 Audio of sermon available by clicking here. 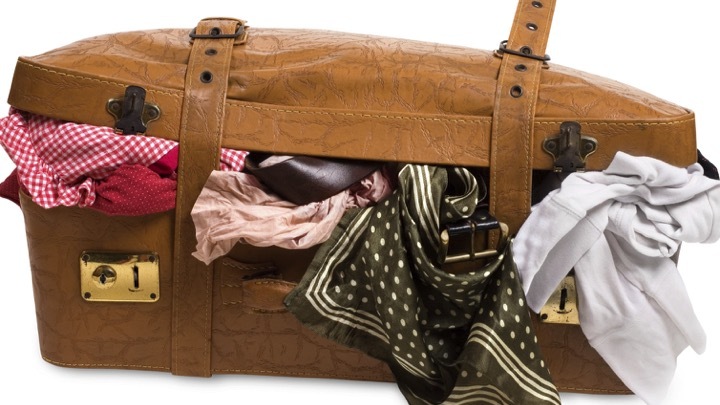 How do you pack for a trip? Do you have a checklist you go through, meticulously making sure to attend to every wardrobe detail and amenity? Or do you do my dad’s method, working head to toe, thinking through every detail of what he would need for a trip, contacts, toothbrush, shirts…you get the idea. Depending on where you’re going the list might change. As my sister was packing for her honeymoon in Jamaica this past week she certainly packed differently than I did when I was headed towards Cincinnati for her wedding. Your packing list can also change depending on how much room you have to pack. I know several members of the Tres M trip packed very strategically to make sure they could get all of their personal items as well as donations of toothbrushes and soccer balls, some packing, weighing, and repacking till they got it just right. My parents sometimes go on camping trips on my dad’s motorcycle and they have to be very creative in the packing of the small trunk on the back of the bike, prioritizing camping equipment over a diversity of clothing. But, what about when you are unsure of your destination? 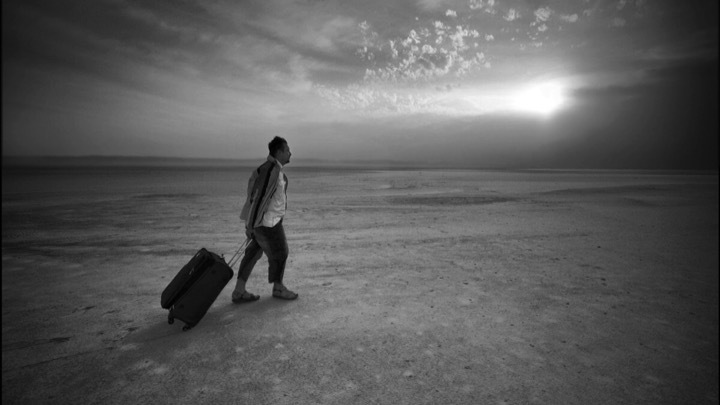 How do you pack for an uncertain future? There are times when all the list making in the world cannot prepare you for what is to come, when what is needed are not things, but strength and hope-filled conviction. Just a few moments ago we watched a video of our X-Team kids, telling us about how they understand what it means to be “beloved.” One of the things this church does very well is that from an early age the children, youth, and adults of this church hear and recite the affirmation that they are a beloved child of God. It was a joy to interview the X-team kids and to have the opportunity to hear how this message has become a part of them, and how it frames their views of how they should care for others, and how God cares for them. It’d be a nice and happy place to end our scripture passage, basking in the love-drenched identity of Jesus as beloved child of God. It’s tempting to tack on an “and then they all lived happily ever after, Amen!” to the end of it, close the book and go on our merry way. But that’s not our reality, and that’s not our scripture. In the very next verse Mark’s gospel tells, “and the Spirit immediately drove him out into the wilderness. He was in the wilderness for forty days, tempted by Satan; and he was with the wild beasts; and the angels waited on him.” So much for a happy baptism day. Certainly somebody could’ve thrown him a brunch beforehand at least. But no, Mark’s gospel doesn’t allow for that, and Jesus is immediately thrust into the wilderness. If you heard me preach on Mark’s gospel a few weeks ago you’ll remember that “immediately,” is a favorite word of this gospel, God’s action is decisive and encompassing. 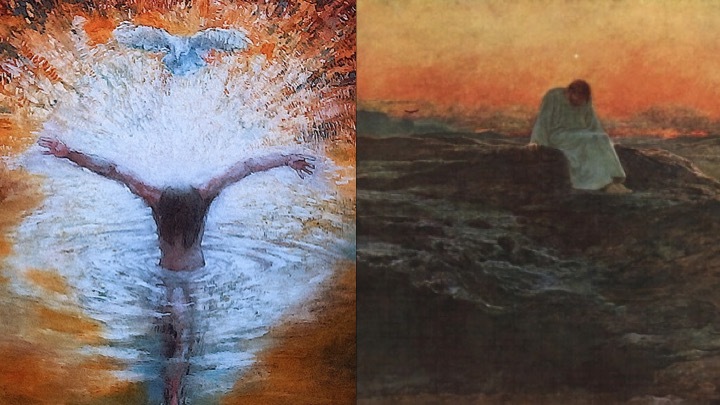 Though these two snapshots of Jesus’ life, baptism and wilderness, may seem incongruent, I would argue that they are actually a very important pairing. When Jesus goes into the wilderness it is not as one lost and alone, but as one claimed as beloved, as one accompanied by the Holy Spirit. This is foundational to our own life in God as well: claimed by God, we face the world; confronted by the world, we are sustained by our identity as God’s beloved. 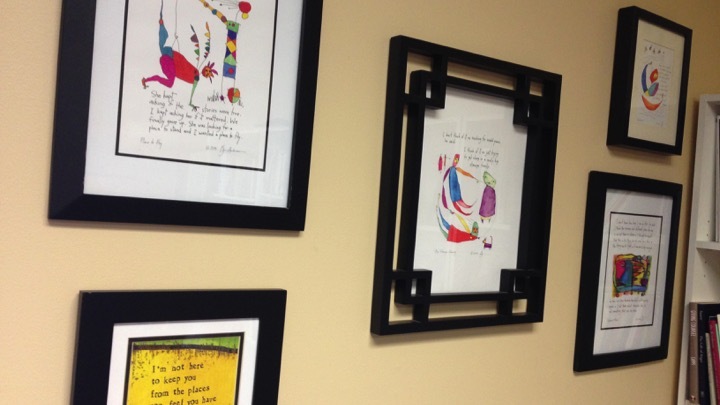 If you visit my office, and I hope you will if you haven’t yet, you’ll see on the wall several pieces of art by one of my favorite artists, Brian Andreas. His whimsical, child-like drawings feature stories in the form of anecdotes, vignettes, and snippets of conversation. Brian Andreas is able to capture emotional truths in just a handful of words. For me, the prints on my wall nod towards my own theological understandings of how I understand God and God’s relationship with us. I believe this is God’s intention for our lives, to love us in and through our every wilderness, providing a light in darkness, manna-sustenance in our journeying, and a way home for every prodigal son or daughter. This is why we as a church go to such lengths to affirm the call that each of you is a beloved child of God. 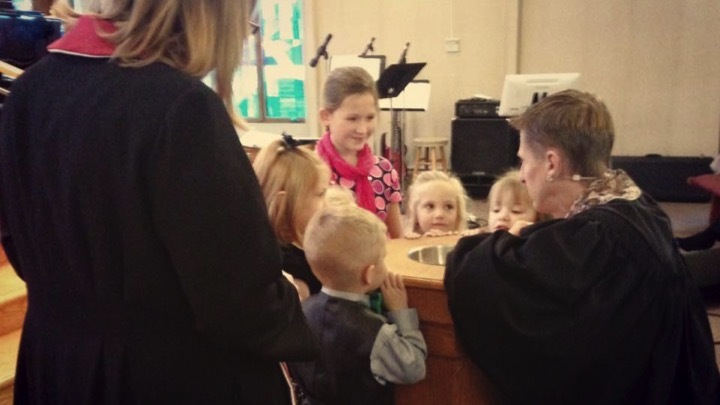 We hope that this church will be a place where you feel the baptismal waters rush over you, where you experience God’s love through the love of your Christian brothers and sisters. And then, when you are confronted with the wilderness of this world, the darkness that you will inevitably face, that you are fortified for those journeys by the love of God and the deeply rooted knowledge that you are a beloved child of God. 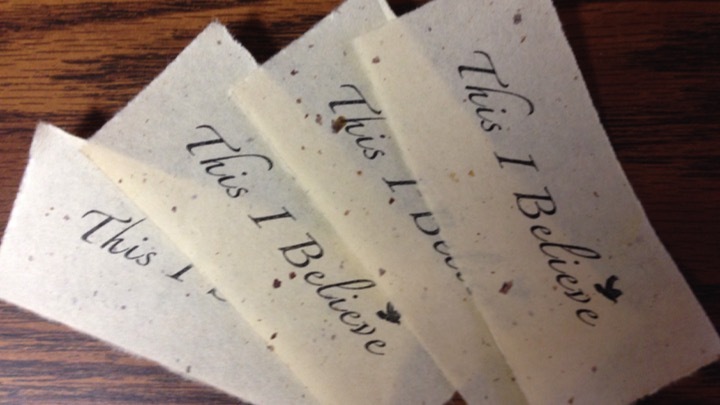 One of the ways that we are seeking to deepen our affirmation of God’s claim on our life this Lenten season is to state what we believe on these pieces of paper, so that our experiences of God might live on into 2065 when our time capsule is opened for those Presbyterians of Holt who will then be celebrating 200 years together as a congregation. Confessional statements can be their own sort of spiritual tool for our journeying, allowing us to claim our identity in God and confront the world around us. 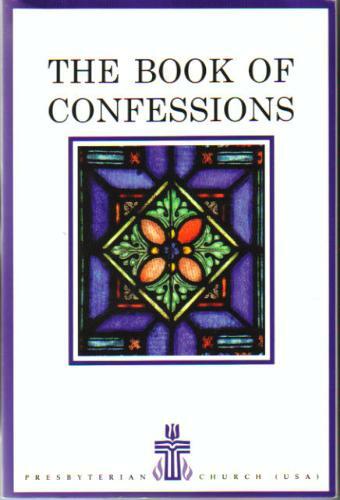 As we have been addressing our denomination’s Book of Confessions throughout this year it’s been revelatory to see how each confession has been shaped by the theological, social, and political issues of their time. Most recently, I taught a class on the Theological Declaration of Barmen, the panel of which we rose today. It is an apt confession to be paired with our scripture today as well as with this, the first Sunday of Lent. The Barmen was written in a very dark wilderness time, as Adolph Hitler was rising to power in 1930s Germany. In all times, the world offers untruths about our identities and value as individuals, but in 1930s Germany these untruths were amplified and propagated to a devastating and horrific extent, as racism and nationalism superseded humanity. It is staggering to be confronted with the terrors of that dark time in history. To gain some sense of the Christian resistance to Hitler in the context of that time I read various sermons in an anthology called, “Preaching in Hitler’s Shadow: Sermons of Resistance in the Third Reich.” In it was a sermon by Gerhard Ebeling, preached at the funeral of a 34 year old German man who was systematically killed by the German government because they saw him as unworthy of life, a view so abhorrent it is hard to fathom in our context, but was indoctrinated in many Germans at that time under the banner of national strength. While I cannot begin to comprehend the depth of wilderness surrounding Ebeling and this grieving family at this time, these are gospel words that are familiar to me, that speak hope into our world today, and whatever is to face us in the future. This is what the church is about, drawing close to that message of a love that never abandons or forsakes us, giving us the strength of the Gospel to stand in the face of whatever may come. We are indeed beloved children of God, and so I ask you to join in the message our children know so well. Let us read on the screens, inserting our own names as we go. “I [state your name], am a beloved child of God.” And all God’s children say: Amen. 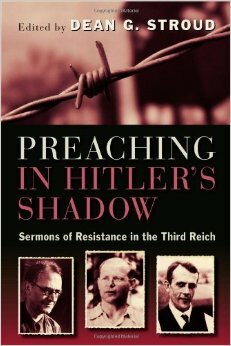 Dean Garrett Stroud, ed., Preaching in Hitler’s Shadow: Sermons of Resistance in the Third Reich (Grand Rapids, Michigan: William B. Eerdmans Publishing Company, 2013), 139. I realized the other day that I’ve been a fan of Brian Andreas work for ten years now. I first came across his art in a book of his when I was on a family vacation to Mackinaw Island, MI. I picked up the book in a shop and just kept laughing and nodding at all of the stories. They seemed to give context to a lot of emotions that I couldn’t quite figure out how to put into words on my own. Over the years these stories have colored my life with their cleverness, wit, and honesty. While I could share meaningful Story People stories all day long, I figured a good tribute to Brian Andreas would be to share a handful of stories that portray parts of my own theology, that is how I understand God and God’s relationship with us. 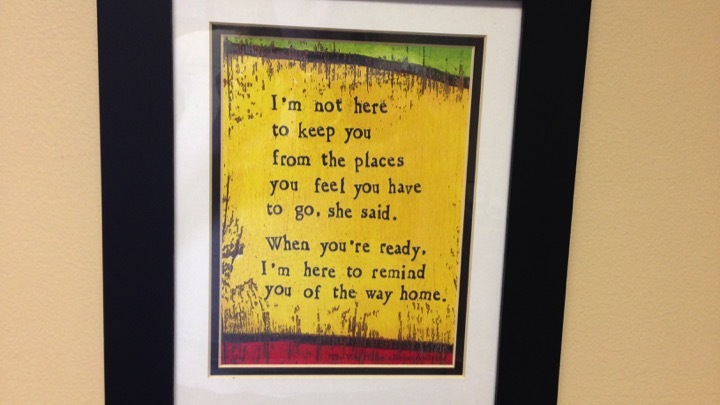 Four out of the six of these decorate the walls of my church office. Rather than explain my own understanding of each of these, I welcome you to read them yourself, to let them sit with you for a while and soak in. I pray they will bless you as they have blessed me. 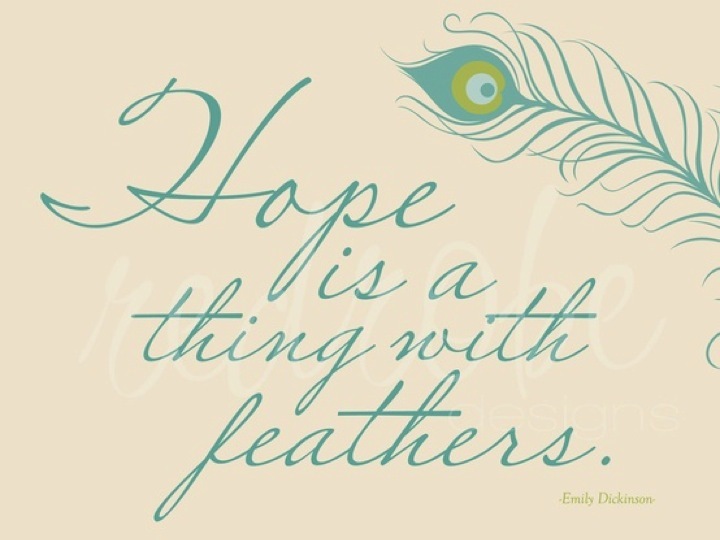 These words by Emily Dickinson speak of hope as a birdlike creature in our soul, singing a song of improvisation, a song that begins without knowing where it will go, that sings wordlessly, unceasingly. To many faith can seem like a strange or elusive thing, it is, by definition, a trust in a promise without concrete evidence. 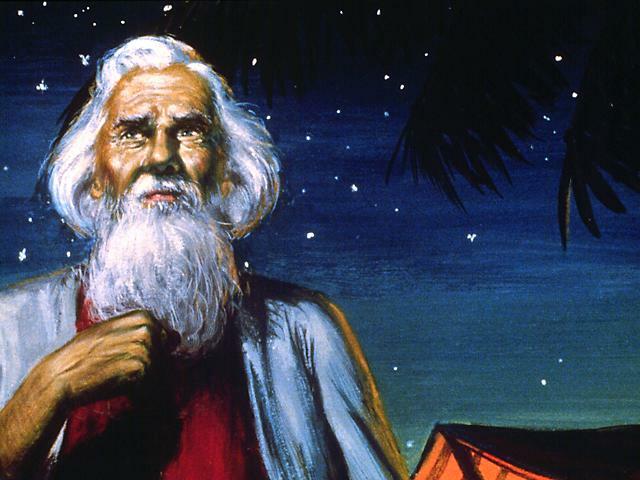 It says that Abraham “hoped against hope.” Abraham had hope in that which was deemed impossible, that which seemed ungraspable. The “thing with feathers” inside of him sang a tune that he couldn’t know the words to. He hoped for the impossible. 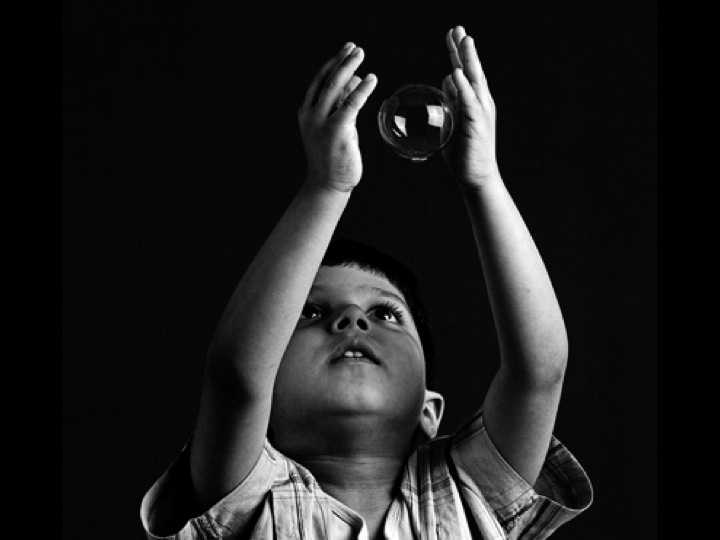 What are the impossible things that you hope for? The things that might seem foolish. The things that might even hurt to hope for? The places in our life where to ask God for a yes risks possibly receiving an unfathomable “no.” How might we trust God in these circumstances? How might we begin to see these things as possible? 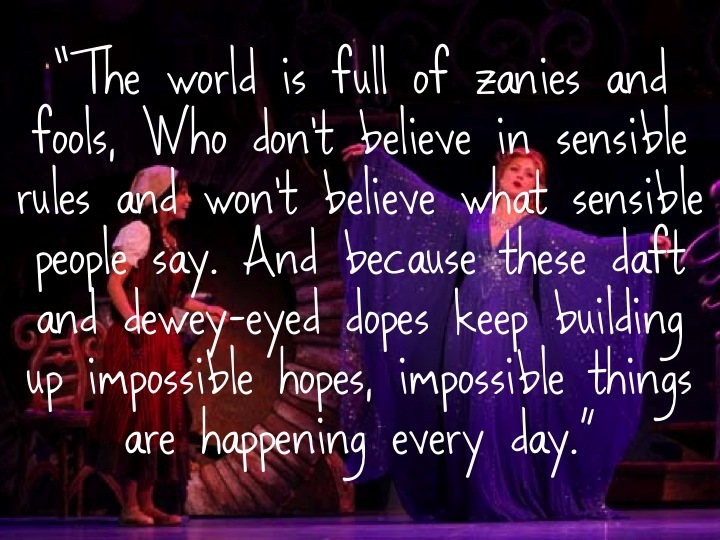 How might we hope unceasingly? 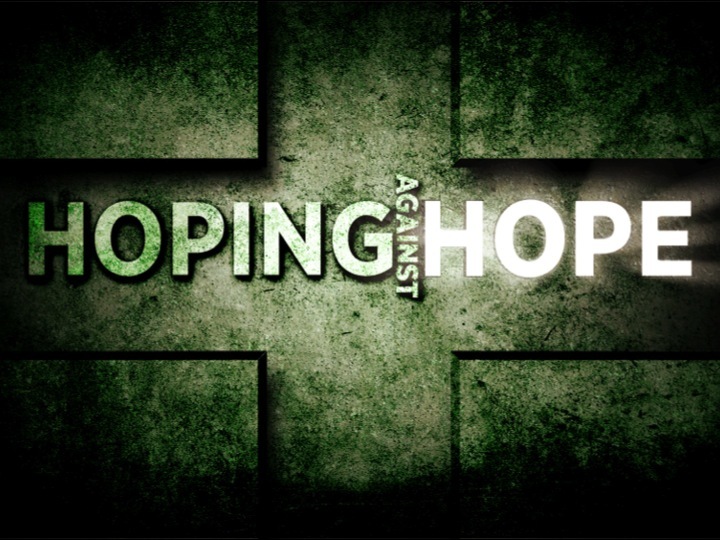 How might we hope beyond hope? 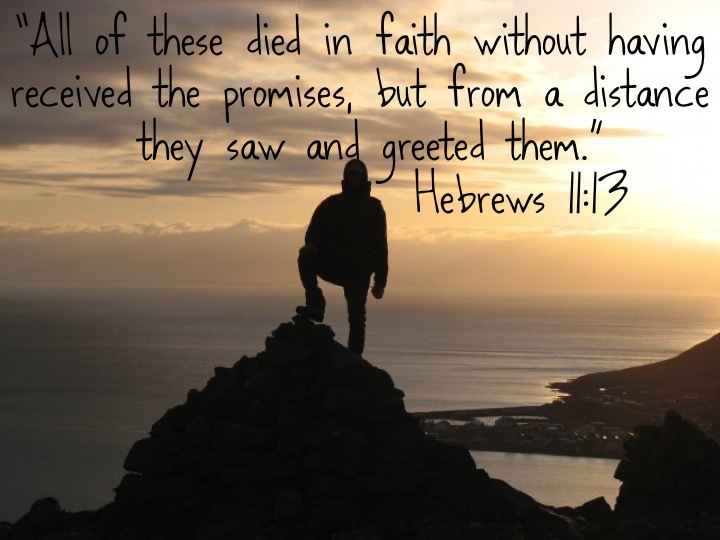 Our passage today says in Hebrews 11:13, “All of these died in faith without having received the promises, but from a distance they saw and greeted them.” Can we really take comfort in hopes that our not answered in our own lifetimes? The unceasing song of hope, does not end when we are no longer the ones singing it. To have faith is to trust in the promise that just as the blessings of our lives came from that which was only promised to those before us. That line, “I am the dream and the hope of the slave” haunts me. Though I do not have ancestral roots in 19th century American slavery, we as children of God, come from a people enslaved. 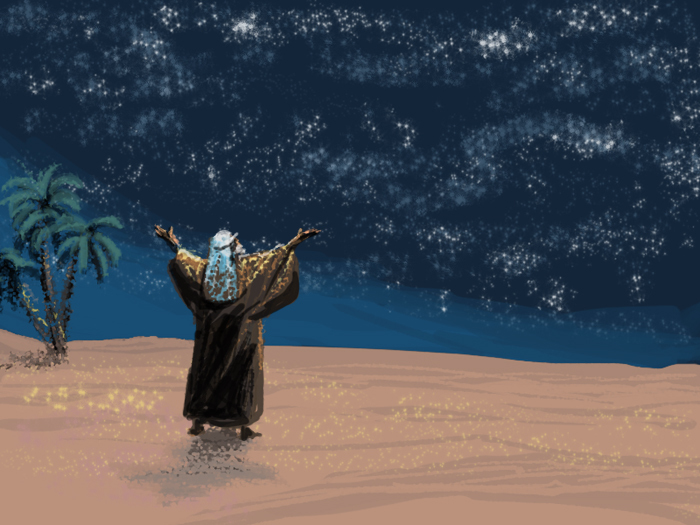 Our faith’s origins are found among those slaves in Egypt, those aching for freedom, aching for the Promised Land they would never live to see. We are their dream and their hope. We are the harvest of that deep grief, of that desert wandering. The hopes of our hearts may not always come into fruition before us, but as heirs of salvation, workers in God’s kingdom harvest, our acts done in faith bring life to the hopes of those who come before us. 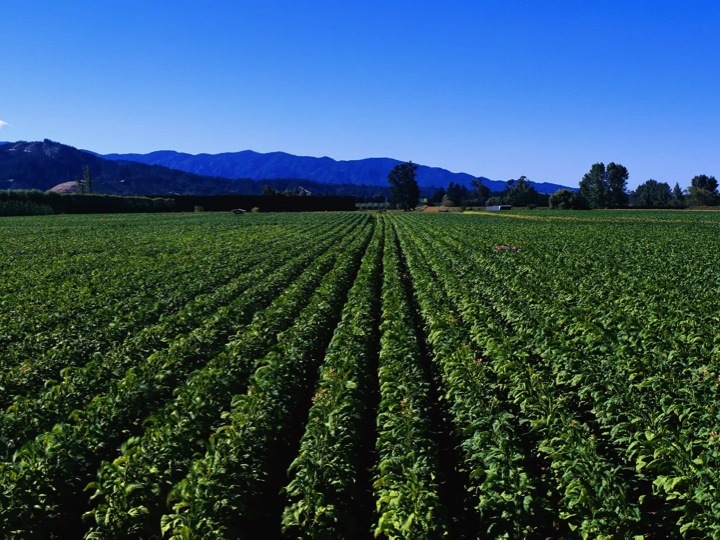 We reap a harvest for which we did not labor, and we hope for a promise that we may not witness. 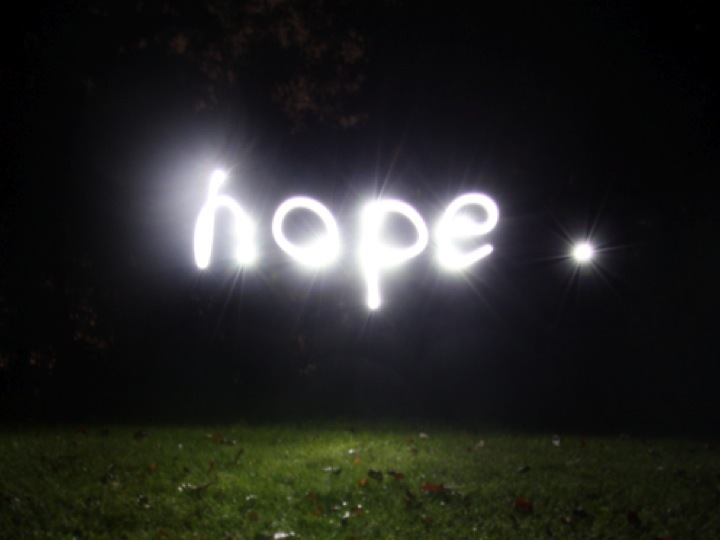 How may your hope spur you to action? When something seems impossible, our fear can paralyze us. May we be bold in our hope, allowing ourselves to hope for what seems impossible, to invest in the promises of God’s goodness. May we be bold to invest in the future we may not see. 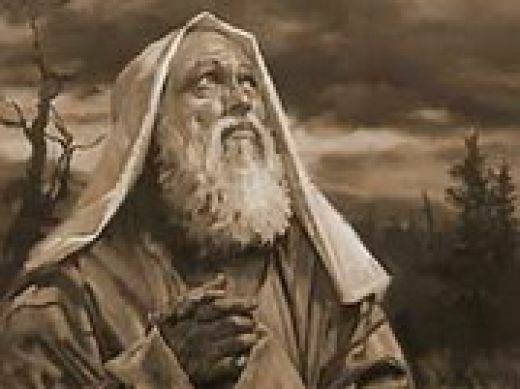 One of the hardest prayers to pray is one we echo week after week in the Lord’s prayer: “thy will be done.” This short and simple phrase can seem an easy one to pray when we are thinking of the circumstances of another, but in our own circumstances it can seem callous or like an act of retreat. 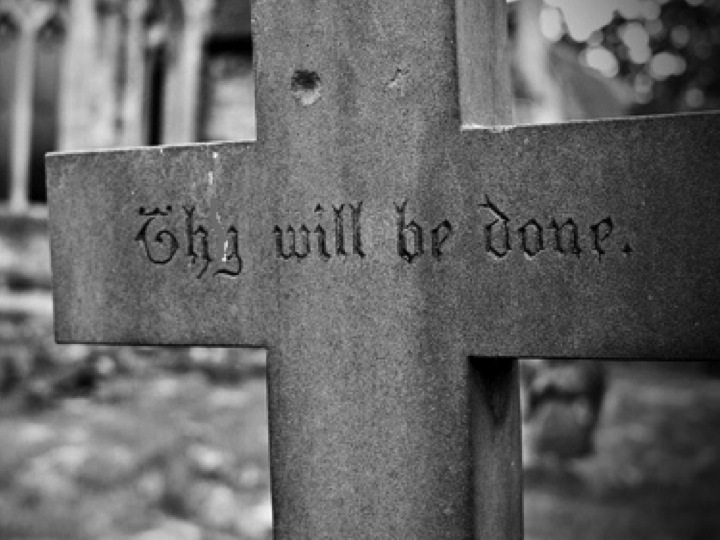 Though “thy will be done” is a prayer of surrender, it is not one of retreat. 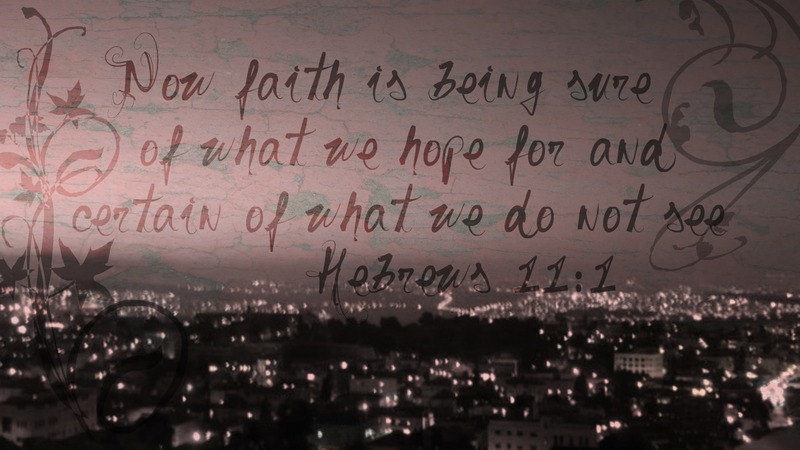 It is faith in allowing our hopes to rest in God’s hands. May we have faith in the promises of God’s kingdom. May we sing the tune of hope even while God is still revealing the words. Amen. my country. Take me home. Also, this sermon brought up for me the phrase “no act of love is ever wasted.” “No Act of Love is Ever Wasted,” is also the name of an excellent book by Richard L. Morgan on “The Spirituality of Caring for Persons with Dementia.” If I were to have gone that route with the sermon, there is much to be discussed of how some people with cognitive disabilities are often seen unworthy of the basic necessities of love and relationship simply because of an inability to respond. A perspective that is confronted by this book. As we continue to celebrate Christ’s resurrection on this day after Easter, I am reminded of the stories that follow Christ’s resurrection: the empty tomb, Christ’s appearance in the garden, and one that is particularly on my mind tonight, Thomas’ doubt of Jesus’ resurrection. 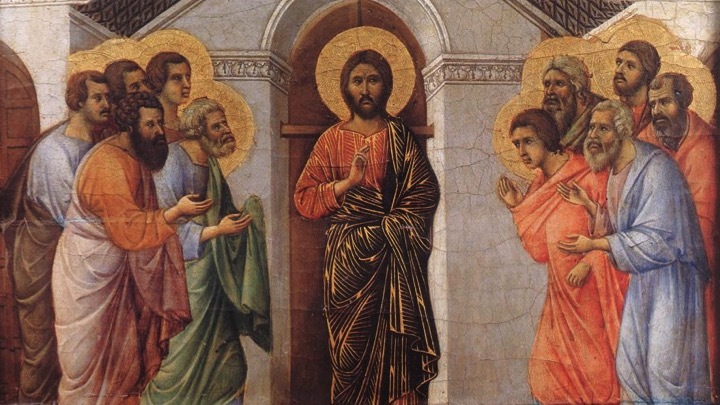 I get why Thomas wanted to see Jesus and touch his wounds: he wanted to know that Jesus’ resurrection was real. He wanted to know that this Jesus to whom he had devoted himself was truly much more than simply human or a apparition or a hoax. Jesus obliges, offering his hands and side to Thomas for inspection. Jesus, the resurrected, incarnate, God allows himself to be poked and prodded for Thomas’ doubt to be satisfied. Belief in something you can see and feel is simply an understanding of the tangible, unquestionable, entirely fathomable facts. However, God is so much greater and more complex than anything that can be explained by reason. Only through faith can we fully welcome all of God. Thomas understood the basic facts about Jesus’ resurrection, but without mystery-welcoming faith, he could not fully embrace what that resurrection truly meant for our salvation and the Kingdom of God. Nickel Creek’s song, “Doubting Thomas,” speaks with great vulnerability to this text.The lines, “Can I be used to help others find truth, when I’m scared I’ll find proof that it’s a lie,” speak directly to the fear of any of us seeking to teach other’s about God. But that’s exactly where faith comes in. 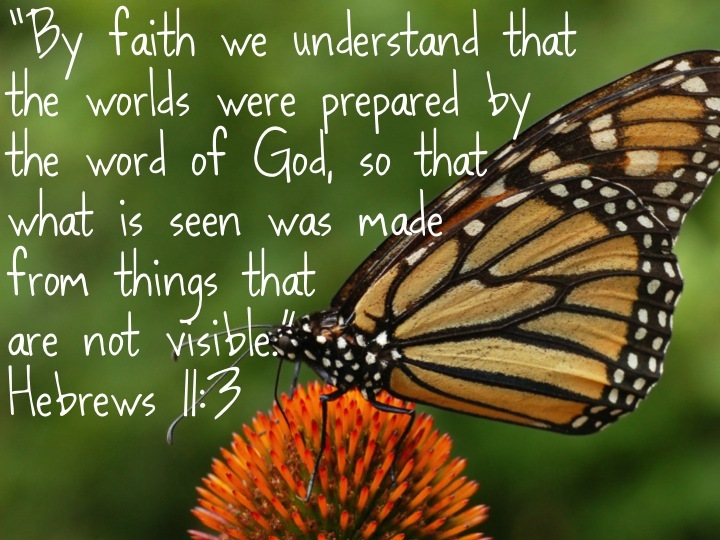 Trusting in God means being open to even the confusing, scary, or complicated parts about God. The very nature of Divinity is the beauty of inexplicability. Accompanying inexplicability with trust in it’s dependability is a frightening thing to do, but in doing so we free ourselves from self-sufficiency and are able to embrace grace.